Home / Health Insurance Company Reviews / Virginia Surety Health Insurance Company Inc.
Virginia Surety Health Insurance Company Inc. This review is for the Virginia Surety Health Insurance Company, Inc. While there is no Virginia Surety Health Insurance company, there is a Virginia Surety Company and this review will focus on that company. However, Virginia Surety does not offer any type of health insurance product, so if you are looking for health coverage you must contact another insurance company. Having trouble finding medical insurance? Enter your zip code and find health insurance rates near you today! About the Virginia Surety Health Insurance Company Inc. The Virginia Surety Company was founded back in 1927. Virginia Surety is the primary property and casualty insurance company that is part of The Warrant Group. With one of the largest and most established underwriting services offered in both the United States and the entire world, the Virginia Surety group was recently rated A- by the A.M. Best Company for financial strength. There is no additional information available online about other locations. The main insurance product that is offered by the Virginia Surety Company is travel insurance. As one of the world’s foremost provides or travel and trip protection, Virginia Surety can protect almost anyone, including students, financial institutions, au pairs, tour operators and even individual travelers. 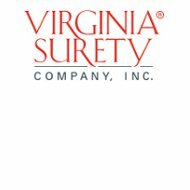 The Virginia Surety Company offers coverage 24 hours a day and 7 days a week to their policyholders. The different coverage options start with travel services, which give you complete trip coverage if you become ill for any reason, are injured prior to the trip, or are delayed for any other covered reason. In all of these cases, you may be completely covered for all the trip expenses you have already paid. The Virginia Surety Company trip cancellation coverage will allow you to get reimbursed for any unused and nonrefundable charges you are responsible for from the travel agency, or any charges from the airline for a cancellation and/or change to your ticket due to a sickness, injury or even death. There is also a trip interruption protection product that covers you for any costs imposed by the travel agency, travel group, or airline, less any credit received, for any type in interruption in your trip due to unforeseen circumstances. In addition, this coverage allows you to get back home if you are overseas. The trip delay insurance coverage allows you to be completely reimbursed one time if any portion of your trip is delayed for a pre-determined length of time due to circumstances out of your control. The travel accident insurance covers you or anyone you are travelling with if you are injured during the trip. If you charge your entire trip on a credit card, you are entitled to a pre-agreed upon benefit should you be injured while on the trip. There is also an extensive baggage delay coverage service, which provides reimbursement if any of your luggage is lost, stolen, delayed or sent to the wrong location. You can also receive complete reimbursement if you have personal items that are missing due to lost baggage. It is important to have documentation of the items in your luggage in case there is a loss. Haven’t found the right health insurance coverage yet? Just enter your zip code now to get health insurance rates today!